Christmas turkey rocketed toward the International Space Station. It went December 5. The rocket also carried cranberry sauce. It carried candied yams. And it carried the obligatory fruitcake. The SpaceX booster missed its landing zone on the ground. This happened after liftoff. It ended up in the sea. It was just a couple of miles offshore. Groans filled SpaceX Mission Control. It is in Hawthorne, California. Live video showed the first-stage rocket booster spinning out of control. It was still high above Cape Canaveral. It was the company's first missed ground landing. It has overshot floating barges plenty of times in the past. But a ground landing is a tougher feat to pull off. Elon Musk is the SpaceX chief. He said the booster appeared to be undamaged. The hydraulic pump for the landing fins apparently stalled. 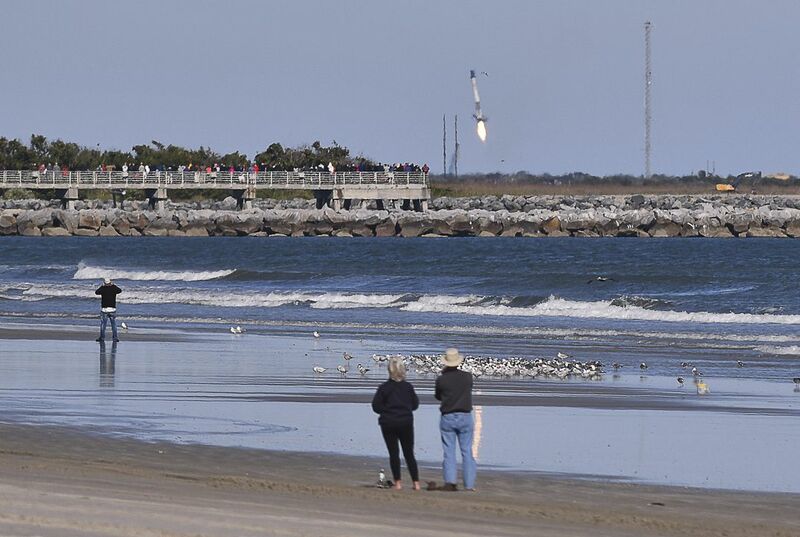 But the engines stabilized the approximately 160-foot-tall booster just in time. This allowed for "an intact landing in water!" That's what Musk noted via Twitter. "Ships en route to rescue Falcon," he tweeted. SpaceX's 12 previous ground landings date back to 2015. All were successful. The company has recovered 32 boosters following liftoff in total. It will be 33 once this one is towed back. That's according to Hans Koenigsmann. He is a SpaceX vice president. He did not know if it could be reused. Koenigsmann said the booster deliberately avoided land. This was after it sensed a problem. This is a built-in safety feature. But it managed to touch down upright. It was in the Atlantic Ocean. It was atop its landing legs. The disappointment was offset by the successful flight of the Dragon capsule. It carried 5,600 pounds of cargo. It reached the space station December 8. "What a great day for a launch." That's what Bob Cabana said. He is Kennedy Space Center director. Cabana commanded the shuttle mission that carried up the first U.S. part of the space station. That was twenty years ago. The delivery includes 40 mice. It includes 36,000 worms. They are for aging studies. They are also for muscle studies. The delivery included smoked turkey breast. It had all the other fixings for Christmas dinner. Researchers expect a tenfold increase in the worm population. There will be plenty of room on board for all the tiny nematodes. It turns out their muscles are similar to ours in structure and function. This makes them perfect lab substitutes. That's according to Timothy Etheridge. He is lead scientist. He works at the University of Exeter in England. The launch was delayed a day. That's because NASA discovered that the food for the mouse-tronauts was moldy. More food had to be delivered. It came from California. Three astronauts arrived at the space station two days earlier. They joined the three already there. The crew included two Americans. It included two Russians. It included one German. And in included one Canadian. The newest residents will remain on board for six months. The others will return to Earth on December 20.